Why it’s important for OBceans to attend our Planning Board meetings. 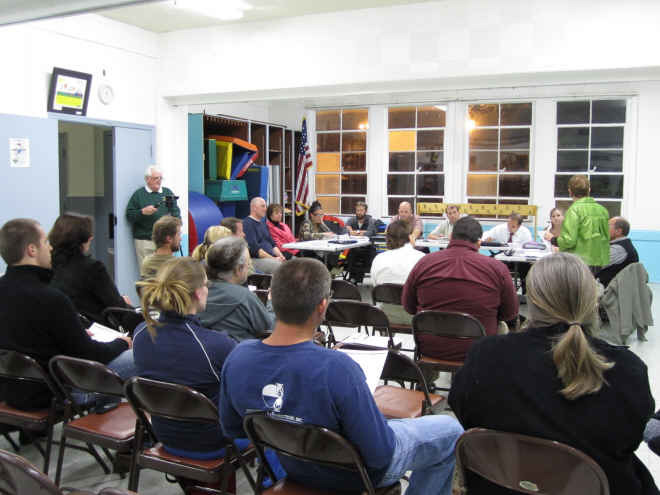 The December 2011 meeting of the OB Planning Board. Editor: A sub-committee of the full OB Planning Board has its monthly meeting tonight, the Project Review Committee. There are four action items on the agenda and Ragster Brenda McFarlane is down for going and urges other OBceans to attend these meetings. The Ocean Beach Planning Board is only as strong as we, the people who care about OB’s future, make it. If we show no interest or concern and express no opinions, then the OBPBs recommendations to the city have no teeth. It is important to understand that the OBPB has very little power unless we give it to them by our actions. So we must attend meeting, and, if we can’t, we must contact the OBPB members-in writing-to express our opinions. That way, when they go to the city to recommend a certain course of action, the city will hear them. Presently, some of OB’s longstanding building guidelines that were painstakingly laid out in order to preserve the OB specialness are being ignored and violated. Builders and interested party’s can get special dispensation to build what they want with just a little effort. I will join in! Show my community some love! I also love sitting in the window at the Harp and watching the Farmer’s Market, but sometimes we’ve got to sacrifice a little now to save a lot later. Hey Breanda, thanks for putting it out there. I’ll see if I can join you at the Planning meeting tonight. REALLY?! This is really how my life gets changed in drastic ways? really?! I looked around. No one present. Really? This couldn’t be real I thought to myself. I almost wanted to scream it outloud. IS this really happeneing? Am I dreaming? It’s really that easy for all of our lives to change drastically just like that. In this tiny little room with tiny little tables and tiny little toes. IDEA: Advertise in the streets. Obcians slither streets. They read signs. It would have a huge effect. Advertise on business windows. The town cares. They just need to see it. Few seek it. Newer Article: What will become of the Nimitz Kids’ Bike Park that was bulldozed?